Textbook: The Historical Background of the Present: 1776 until today. : Winston Churchill held a speech at the University of Zurich on 19th September 1946, in which he depicted his idea of the . Such a union, he claimed, would have to be based on a partnership between France and Germany. : The speech of the former British Prime Minister is printed as excerpts and in German translation in the exercises section of the textbook. The exercises section is printed on coloured paper and is thus clearly distinguishable from the tutorial section. It provides working materials such as sources (reports, certificates, speech texts, contracts) or excerpts from research literature. The textbook’s design is mostly free of images and graphs; additional orientation to the headings and the basic division into the tutorial and exercise sections is only provided by the inverted years, printed as numbers and highlighted by a box. : The speech is part of the chapter of the tutorial section, and is introduced in the paragraph on Basic Features of International Politics under the title, . The paragraph deals in great detail with the security requirements of the European states following the end of World War II, and the Federal Republic’s struggle for European integration, political recognition and sovereignty. Title: "Churchill, Rede Zürich (19. September 1946)"
: Winston Churchill hielt am 19. 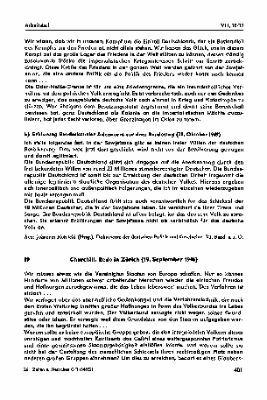 September 1946 an der Universität Zürich eine Rede, in der er seine Vorstellung von den "Vereinigten Staaten von Europa" darlegte. Die Grundlage hierfür müsse eine Partnerschaft zwischen Frankreich und Deutschland sein. Abstract textbook: The textbook for the subject of history was published as the second volume in the series (Times and People). It was used in secondary high school in Germany.